The Ford Theater has an interesting history and reflect the change in radio to adapt to the popularity of Hollywood. It began as a show that wished to distinguish itself from Hollywood-leeching old time radio shows such as Lux Radio and Academy Award Theater. The show stared good but not famous New York Radio performers. Producer George Zachary attempted to use genres popular radio stars rather than Hollywood stars. This version of the show was marked by minimal success and low ratings thus Zachary was replaced with Fletcher Markle, husband to radio legend Mercedes McCambridge. Markle made a reputation for flashy-high budget shows such as Studio One which Ford Theater replaced. The second version included a star-studded cast in which no expense was spared. The Ford Theater also moved west, it starred the top Hollywood celebrities including Jack Benny, Marlene Dietrich, Bob Hope, Bing Crosby, Lucille Ball, Edward G. Robinson, Bette Davis, and many others. 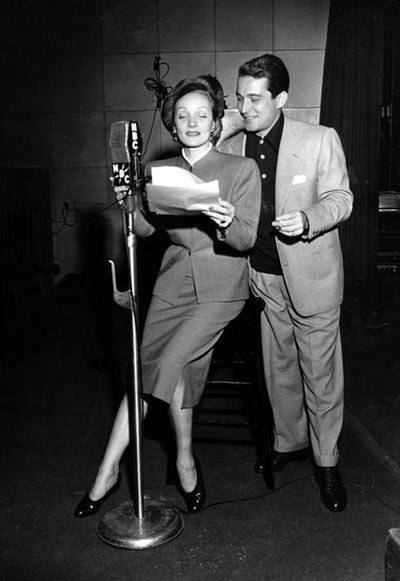 This move made the show a hit old time radio show with these top named Hollywood performers. The Ford Sunday Evening Hour featured music, but in order to reach all Americans, The Ford Theatre began and included drama, comedy, and adaptations of literature and film. They spared no expensive and used the best radio personalities to entertain and advertise Ford Motor products. Though very short lived, The Ford Radio Theater was popular in the two years that it lasted. Be the first to comment on "Ford Theater"